Shelters for immigrant kids are required to provide education services. But how much? In a letter to Trump Administration officials, Democrats on the House Committee on Education and the Workforce are demanding answers about the education services provided to unaccompanied minors housed in shelters. That includes about 2,000 migrant children who were separated from their parents at the border and remain in federal custody. In the Thursday letter to Education Secretary Betsy DeVos and other cabinet secretaries, the lawmakers note a federal court settlement requires the government to provide education assessments to each unaccompanied minor within 72 hours and to provide education services based on their “individual academic development, literacy level, and linguistic ability.” Given those requirements, the lawmakers asked the administration to provide details about how it holds shelters accountable in providing these services along with details about educator qualifications. “In the event of indefinite family detention in [Department of Homeland Security] custody, what are the processes in place to ensure timely assessment and delivery of educational services for each unaccompanied minor?” the 17 lawmakers asked in the letter. At a repurposed Walmart just north of the U.S.-Mexico border, the freezer aisles, toy department, and everyday low prices are nowhere in sight. Instead, the former shopping center that now dons a “Casa Padre” sign houses dorm-style bedrooms, a cafeteria — and classrooms. The facility in Brownsville, Texas, which houses more than 1,400 immigrant boys, was ground zero for the political furor over a recent Trump administration policy that separated immigrant children from their parents — a practice President Donald Trump moved to end Wednesday after signing an executive order that aims to detain families together. Meanwhile, on Thursday a senior government official told The Washington Post that U.S. Border Patrol agents were told to stop referring immigrant parents with children to courthouses for criminal charges. While the president’s executive order to detain families together may face its own legal obstacles, it doesn’t offer a solution for the more than 2,300 children nationwide who have already been separated from their parents and remain in federal custody. Federal policies require shelters for immigrant youth — of which there are about 100 across 17 states — to assess the educational abilities of newcomers and to provide them with instruction. As the shelters typically house unaccompanied minors who stay in them for a short period, education programs in them are vastly different from a typical American school. As for children currently separated from their parents, however, it remains unclear how long they’ll be housed in the shelters and whether they’ll be reunited with their families. Under the executive order Trump signed, the government seeks to detain immigrant families “together throughout the pendency of criminal proceedings” and will request that a federal court modify a 1997 settlement agreement that prohibits immigration authorities from housing children in detention for more than 20 days. That same agreement outlines the educational rights of immigrant children in federal care, and if children are ultimately detained alongside their parents, they’ll still be entitled to classroom instruction, said Julie Sugarman, a senior policy analyst for education policy at the Migration Policy Institute, a nonpartisan think tank. Inside America’s largest shelter of its kind, reporters allowed to visit the Casa Padre facility observed workers serve the children chicken and vegetables. In an auditorium, children watched the animated movie Moana. And inside the small classrooms, the immigrant youth received an education — offered in two six-hour shifts, Monday through Friday. Casa Padre is operated by Southwest Key, a nonprofit that runs the shelter under a government contract and, as of last week, is responsible for the care of more than 5,100 immigrating children in facilities across three states. But its services don’t stop at shelters for immigrant youth. East Austin College Prep, a charter school in the Texas city where the nonprofit is headquartered, also operates under the Southwest Key umbrella. Although Casa Padre and shelters like it across the country are required to provide educational services to the youth housed there, those programs weren’t set up to serve children for an extended period, Sugarman said. For years, the shelters have housed unaccompanied minors who arrived to the U.S. border without their parents and, during their stay, the Department of Health and Human Services’ Office of Refugee Resettlement seeks to unite the children with sponsors, like parents, close family friends, and in some cases foster care. Although the time span has ticked upward in recent years, the government says immigrant youth reside in the shelters for an average of 57 days. 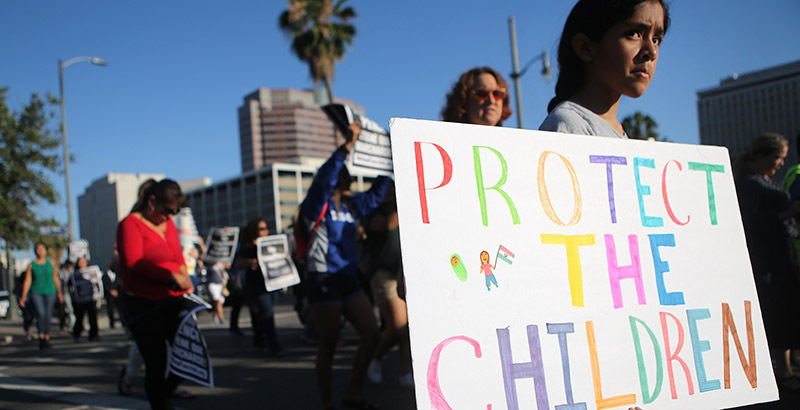 Under federal law, immigration enforcement authorities are required to hand over unaccompanied minors to the Office of Refugee Resettlement, which funds the youth shelters. Those shelters must provide the children with educational, health, and case management services. At the shelters, educational services should begin within another 72 hours, Sugarman said, when the staff provides children with an educational assessment. Those assessments vary between shelters, she said, and are less formal than those found in typical public schools. After the assessment, children in shelters typically receive an education in several groups based on age or academic competency. “I know that shelters do ask for materials and assessments from surrounding districts so they can kind of mirror what’s going on, but … that really reflected a time when kids were likely to be released into the community,” Sugarman said. The 1997 Flores settlement, which began as a class-action lawsuit, lays out specific standards shelters must follow. That includes providing “education services appropriate to the minor’s level of development and communication skills in a structured classroom setting.” Instruction must center primarily on developing “basic academic competencies and secondarily on English language training.” Subjects include science, social studies, math, reading, writing, and physical education. While children receive education services in the shelters, they are not enrolled in local schools, according to a Department of Education fact sheet. It’s the responsibility of the Office of Refugee Resettlement, Sugarman said, to hold shelter operators accountable for the services they provide. Shelters aren’t held to the same academic standards as public schools, she said, because they were never intended to provide long-term care. Southwest Key’s Casa Padre shelter first drew national attention when officials declined to let Sen. Jeff Merkley, Democrat of Oregon, tour the facility. In response, officials there facilitated the media tour to calm concerns about their level of services. Southwest Key spokeswoman Cindy Casares didn’t respond to multiple requests for comment, but she wrote in an email to Politico that children in their facilities are receiving classroom instruction from licensed teachers and officials have not struggled to meet the requirement since the Trump administration’s “zero tolerance” policy went into effect. Last week, Southwest Key founder and CEO Juan Sanchez told The Washington Post that youth separated from their parents made up about 5 percent of residents at Casa Padre, which houses youth between the ages of 10 and 17, and about 10 percent of residents across the nonprofit’s 26 shelters. Before Trump signed the executive order, several prominent education groups scorned the Trump administration for separating immigrant children from their parents. Alberto Carvalho, superintendent of Miami-Dade County Public Schools, who is himself an immigrant, has also taken a stand. In a letter to Homeland Security Secretary Kirstjen Nielsen, Carvalho noted that the Florida constitution says all children in the state, regardless of immigration status, are entitled to an education.